XI'AN, China, Sept. 13, 2018 /PRNewswire/ -- The West China Cultural Industries Expo (the "Expo"), a platform for gathering and promoting the best and most innovative cultural businesses in western China, has opened in the ancient Chinese city of Xi'an, showcasing the rich heritage of the region, spreading the "Spirit of the Silk Road," and reinvigorating the region's cultural and tourism industries with the help of digital technology. With a major exhibition, several industrial forums, art competition and performances, the Expo presents the glamor of Xi'an, the cradle of Chinese civilization and the starting point of the ancient Silk Road, to the world. The event coincides with the fifth anniversary of China's modern Silk Road project, the Belt & Road Initiative (B&RI), that aims to link China with Eurasian countries via a series of infrastructure projects that follow ancient trade routes. A wealth of exquisite artworks by Chinese art masters from Shaanxi Province were exhibited during the event, while collections from Shaanxi's national-level museums were also on display. Embracing the internet, the Expo allows all exhibitors to upload their products online for electronic viewing. To take advantage of the huge opportunities brought about by the B&RI, a forum was held at the Expo to discuss the development of digital innovation -- a strategic emerging industry in China that covers areas including e-publishing, cartoons, gaming, online education and virtual reality (VR). The industry is at the forefront of the technological revolution, and by embracing digital technology, it can breathe new life into China's ancient civilization. The Expo has given a boost to western China's tourism business and put Xi'an in the global spotlight. It is the prelude to Xi'an's International Tourism Festival, which will invite travelers both home and abroad to a city that is already an international tourist destination with its over 3,000 years of history and world-renowned attractions such as the Terracotta Warriors and Horses and its ancient City Wall. 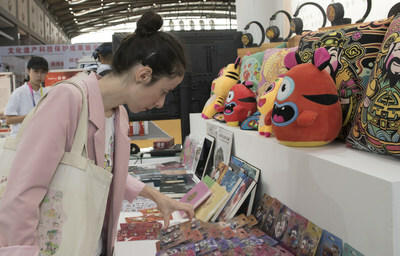 The eighth West China Cultural Industries Expo held in Qu Jiang, Xi'an, has attracted over 800 exhibitors from 11 provinces and municipalities in western China, as well as from 12 countries and regions including Iran, Thailand, Cambodia, the United Kingdom, Italy, Nepal, India and Saudi Arabia.